Higher and higher temperature rises but it does not stop the insatiable appetite for food. The night snack streets are witnessing more and more people out and about in their T-shirt and shorts, enticed by the mouth-watering smells from kebabs and noodles. Now we introduce Hangzhou’s three night food streets, which sit in the city’s east, middle, and west. In the west of Hangzhou, Jingzhou Road and Fengtan Road are places where people kill time. There are fashion-brand stores, cinemas, boutiques, shopping malls and tens of restaurants, cafes, and a bunch of food stalls. The Jingzhou Road is literally a night food street as it houses dozens of restaurants, which becomes bustling once it gets dark. The sizzling lamb kebabs, oven-fresh grilled oysters, fiery-red crayfish shining under neon lights. How could you ignore them? Half of the stores sell grilled foods, and among them, Sina’s Date Scallop King (新浪有约扇贝王, 74 Jingzhou Rd), is one of the most populous. This place sells barbecued scallops, oysters and abalone, as well as lamb kebab and grilled vegetables. Five years ago the chef/boss surnamed Jiang was running one booth, today he owns over 10 branches in the city due to the good reputation of his food. 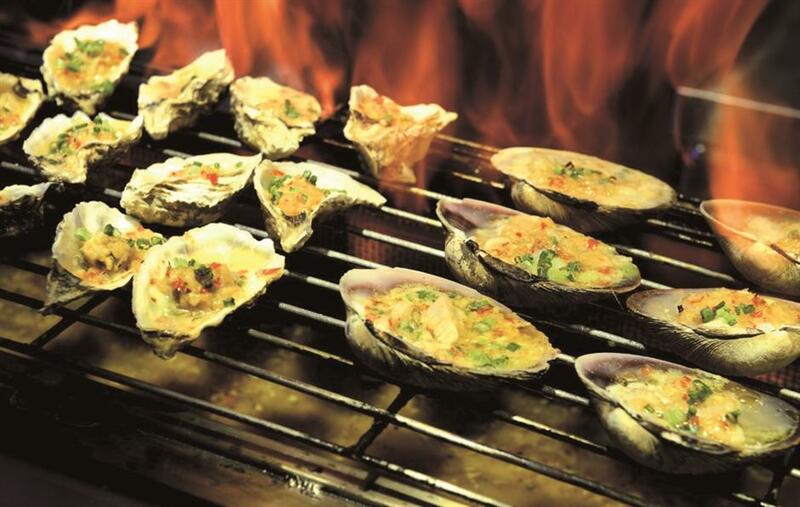 On the menu, six barbecued oysters/scallop cost 50 yuan (US$7.3).While gourmets recommend Sina’s Date Scallop King for its scallops, they also recommend Da Chen Grill (大陈烧烤, 84 Jingzhou Rd) a few steps away from Sina’s Date, for its grilled meat. Da Chen uses less seasonings than others and therefore it heightens the original taste of foods. Fengtan Road also boasts lots of restaurants. If you like to have a try of Northern Chinese food, Central Plain Yi Da Wan (中原一大碗, 270 Fengtan Rd) is recommended for it is authentic Henan dishes.The name of the eatery implies that it offers a hearty meal. Yi da wan means a big bowl in Chinese. And it is true: all of the dishes are served in bigger plates and bowls than in other restaurants. Its signature dish is Henan stewed noodles, which are shaped flat and broad and covered in vegetable oils. The noodles are covered in quality mutton soup, which has been braised for more than five hours and with tofu, kelp, shredded squid and quail eggs. Being a narrow strip in downtown, this lane is considered a folk street known for its nice mix of residential and commercial constructions.Its name Baijingfang literally means “a block of 100 wells.” At one time it did boast 99 wells, but today the lane features almost 100 restaurants ranging from Chinese fastfood and barbecue items to mutton and seafood. 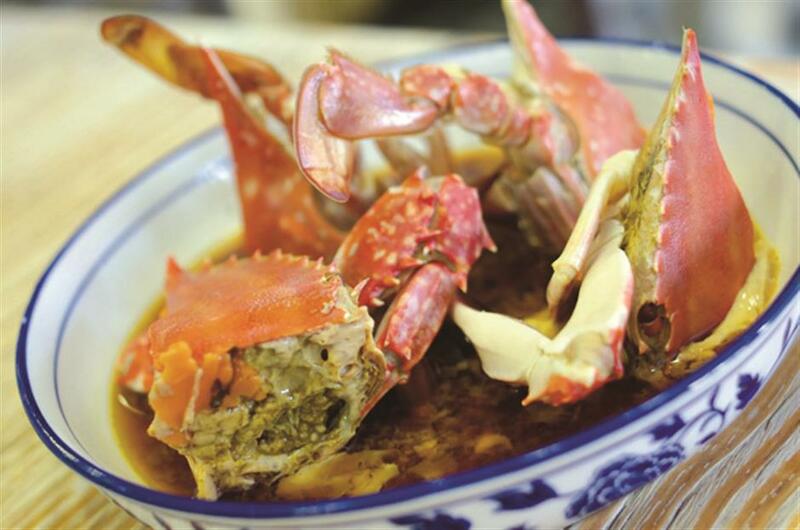 Among one of the oldest, and most populous, is Zhang Huli Crayfish Restaurant (张胡李龙虾馆, 32 Baijingfang Lane). As one of the first crayfish restaurants in the city, Zhang Huli today owns five branches, selling thousands of kilograms of crayfish every day in this season. 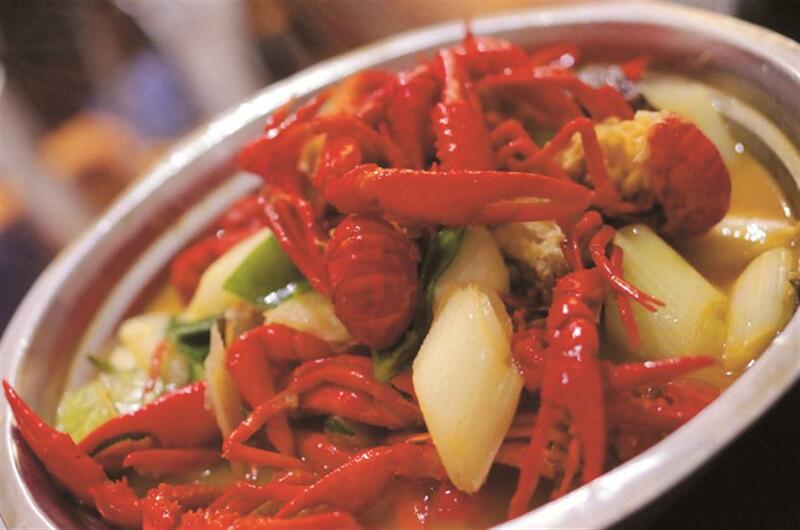 The owners put this down to its diverse recipes — it offers 16 crayfish dishes, including spicy, curried, braised with turtle, braised with pork ribs, barbecued with garlic and with sweet and sour fried rice cake.The price of crayfish vary from 58 to 388 yuan. Other ordinary local dishes and BBQ foods are also listed in the menu.Not far from Zhang Huli, Yuanyiguo Goat Spine Restaurant (缘一锅羊蝎子, 10 Baijingfang Lane) is an old brand too. 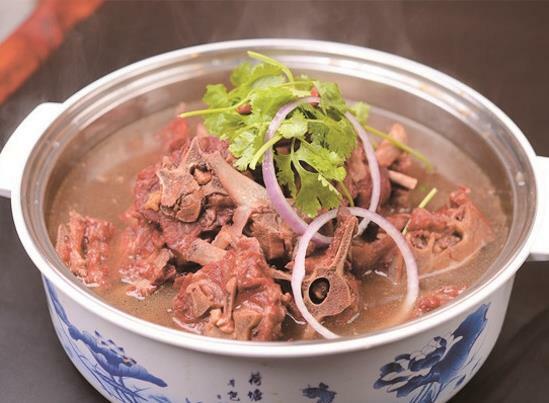 It mainly sells hotpot boiled with goat spine, which is considered a delicacy because the bone is rich in calcium and the meat is lean. The restaurant also sells barbecued food such as goat spine, goat hoof, goat shank and goat rib, all salted and peppered.Other foods for the pot are customary ones.Another star restaurant on the street is the Little Chef Zhoushan Seafood Restaurant (小厨师舟山沈家门小海鲜, 43 Baijingfang Lane).It purchases seafood directly from Zhoushan and uses a light recipe to cook the clams, crabs, fish, and shrimps to maintain the umami of seafood. Jin Jiang Seafood Town is where people in the east of the city fish for food.It stands next to Jin Jiang Seafood Market. It is little wonder it has survived and thrived in the last decade, as it’s the only seafood stall street in the city. It is a block north to the crossing of Qiutao Road and Jinjiang Road, which houses a dozen of seafood restaurants, opening from noon to 4am next morning. Da Tang Shenjiamen Seafood Restaurant (大唐沈家门海鲜, 21-24 Jin Jiang Seafood Town) is one of the earliest. Over 10 years ago, owner Tang Yansheng opened his small seafood stall, and gradually turned it into a store. In the following years more seafood restaurants have sprung up.While most of the restaurants purchase ingredients directly from the nearby market, Tang insists on purchasing seafood directly from Shenjiamen in Zhoushan, known as a birthplace of marine food products for “better quality and faster speed. ”Therefore one of the restaurant’s aquariums contains “whatever fished” by a Zhoushan fishing club.The average consumption on the street is from 100-200 yuan (US$15-30)per person.All restaurants follow Zhejiang-style light recipe: to boil, saute, or steam the foods. A warm tip is that iced beer coupling with seafood sounds like a great match, but in fact many people get an upset stomach with that combination. Liquor, Chinese white wine, yangmei jiu (waxberry immersed in white spirit) are suggested because strong alcohol kills viruses.